We’re almost up! Press play below for a behind-the-scenes look at the final stages of construction and an interview with AL_A associate Alex Bulygin, who’s here to oversee the build this week. 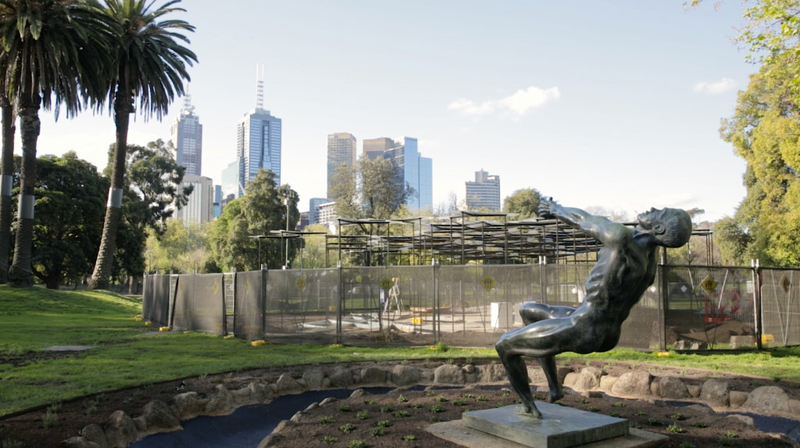 To make their 2015 MPavilion design a reality, AL_A have been collaborating with Australian manufacturers mouldCAM and builders Kane Constructions, as well as global engineering firm Arup. The pavilion uses boundary‐pushing technology of composite materials to form petals that are five metres in diameter but only a few millimetres thick. Alex explains: “It’s a modular design that consists of thirteen big and thirty small petals that react to the environment, shiver in the wind and create a game of shadows and reflections underneath.” Thanks to tin&ed for this interview and sneak peek!